Back in the day, before I was a Spanish teacher, I was a musician. I sang in madrigals and show choir, I played several instruments (though not particularly well), but I loved piano. For the first year or so of playing piano, I had to walk across town to our church to have one to play because we didn’t have one at home. I enjoyed it so much that I considered it as a major, but then I realized that I wasn’t deeply passionate enough about it to make the sacrifices that that life would require. Oh, and killer stage fright. THAT will do you in in that field too. Though I’ve left music behind as a daily pursuit, I still surround myself with it nearly constantly. I play it in my classes while students are working, and try to vary what types they will hear over the course of the year. I also incorporate songs into nearly every unit that we study in some form or another. Zachary Jones and Sra. Birch have made this endeavor SO much easier with their activities and databases of artists’ work to use. Which brings us to this week: the week before finals. Here in the southeastern part of the US, we are in a sweet zone where the sun is out, the pools are open, the bugs are really out, and the humidity hasn’t arrived yet. Not exactly a prime environment for focus, motivation, and ambition in our last days of school–for the students or for the teachers! In my novice class, we need to review/practice some key concepts more, like telling what happened in the past and stating/supporting opinions. I also want them to read some more in the target language and interpret the main ideas and key details from what they have read. I also want them engaged in class without having to be a babysitter in these last days! From all of this is born a mini project about well-known musical artists who sing in Spanish. After introducing them to my favorite, Juanes, and modeling a presentation for them, students chose an artist to study from a list compiled with help from my twitter peeps, or they could suggest one that they already knew. Next, they will construct a poster with a basic timeline of key events of the artist’s career and life, a picture, and other pertinent details by using Wikipedia in Spanish. They are also being asked to listen to several songs by the artist and to comment on their opinion of the music. On presentation day, students will play their favorite musical clip as they present their posters in small groups. They will also be prepared to answer questions from their group members about their artists. Their reaction was priceless! I had to hold them back when it was time to sign up for their artists, and they were instantly engaged in the research. Some students asked for recommendations based on their personal tastes, and for the most part I think we were able to match them with someone that they liked. They are actually engaged in trying to get preterit conjugations and preterit v. imperfect right because they have a reason to want to get it right. Add in the cultural aspects and inquiry, and I think we have a winner! They will work on their posters more tomorrow and present on Friday. I’m actually looking forward to what they put together! If you would like a copy of the student assignment sheet, click here. Our artist list is below–feel free to suggest more in the comments! I’m sure I’m not alone in this week’s struggle: AP testing is decimating my classes. Since exams are scheduled during the school day, I am missing up to 50% of my students in each of my classes, depending on which test is being administered. On top of that, it is gorgeous here in NC–the birds are singing, the sun is out, there’s not much humidity, and we all want to be outside. All of these forces work against the fact that there is still teaching and learning that needs to go on. While it would be tempting to relax a little, I believe it’s time to bring out my best game like teams do in the playoffs. If ever there was a sprint to the final championship, we are in it now! Student choice is one of the best tools in my arsenal. Nothing hooks a student’s attention and energy like something that they have selected for themselves. My job is to arm them with the tools they need and then act as the guardrails on their journey. I coach them, cajole them, rein them in when needed, but what I don’t have to do is micromanage them. It’s so refreshing–for all of us! I will have the pleasure of presenting a different version of student choice at ACTFL this fall with the amazing Sara-Elizabeth Cottrell and Laura Sexton. Since our classes will be so disjointed for the next few days, I’m asking students to choose what activities they will complete from a menu of options. Not only will it allow them to have input into their learning, it will also shift the responsibility for learning and completing assignments completely to them. Students who are gone don’t have to worry about having “missed” something; they will just have lost the opportunity to work on their projects. In addition, students who were here are already tutoring their friends who were gone to help catch them up on missed content. They have three choices provided for them: hidden pictures linked to conjugation, conjuguemos, or writing a Kahoot quiz for our class. One group decided that they didn’t really like the options and that they wanted to do their own video… so that’s what they are doing! The second category is “demonstration of mastery”. In this category, students have 5 options for oral presentations about when they were young. Option 1 is to do a presentation like I did for them where they narrate several pictures from their lives when they were young. Option 2 is kind of a play on #tbt and the photos like the ones here. People are taking photos from their childhood and re-enacting them. Students will do this with a few of their photos and narrate the contrasts. Option 3 was inspired by @SraSpanglish and @tandiosa from twitter with some comic help from Jimmy Fallon. Students will briefly retell a few favorite stories about themselves from their parents’ point of view. Jimmy Fallon’s video of #iusedtothink tweets was a good, humorous introduction into this idea–especially the one about the * key and Santa. Option 4 is talking about a few of their favorite things. Option 5 is student choice–they are encouraged to create their own oral presentation project that meets our goals and show their skills. Students completed a short survey to tell me what they planned to work on and what resources they felt that they would need. This frees me up during the class period to just assist them in achieving their goals. Kinda cool, huh? This is the first time I’ve done this particular project–it’s another Aventura Nueva. So far, so good! What are ways that you’ve incorporated student choice into your classes? What benefits and challenges have you experienced as a result? I’d love to hear your thoughts in the comments! This week we tried Kahoot for the first time in my novice and intermediate classes after hearing about it from #langchat people on Twitter. It was a big hit! Kahoot is a quizzing/surveying/polling tool that the teacher creates for a class by entering questions for students to answer. The questions and potential answers are projected for students to see, and then students vote with their smartphone, laptop, or iPad. Though these functions are available in other formats such as Socrative, Kahoot is my favorite so far. 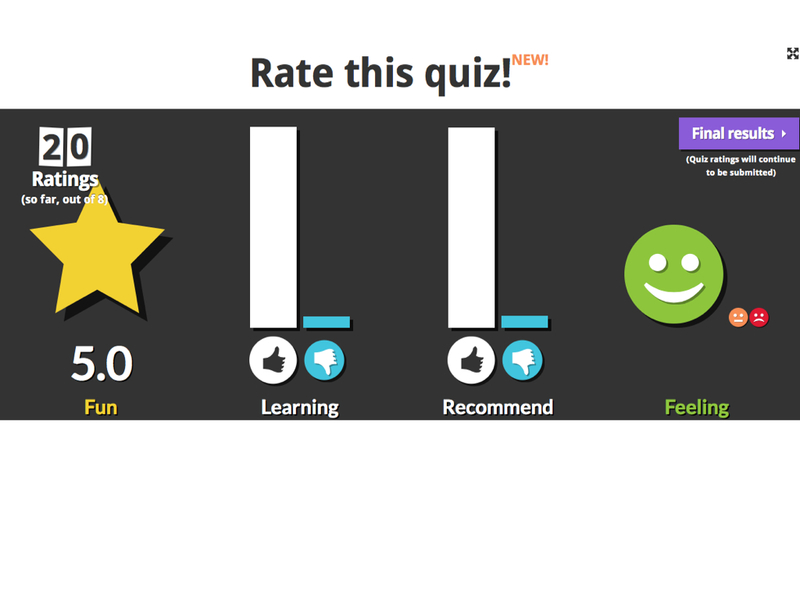 You can share your “quizzes” with other teachers. The quiz I made for my novice class got played in another teacher’s classes, and now she’s making one for our intermediate classes. It has a competitive aspect to it. Students get points for correct answers, and they get more points for fast, correct answers. After each question, students get feedback on their answers AND are told what ranking they are in points compared to the rest of the class. The top 5 are shown on the screen on the “leaderboard”. One struggling student who has been working very, very hard to improve was so excited to see his name up there that he had me take his picture with the leaderboard and his “correct” indicator on his iPad. By the time my next class came in, they all knew that we were playing Kahoot because his photo had been retweeted so many times! There is also a final leaderboard at the end of the game, and those 5 get a trip to the treat bin in my class as an extra bonus. I love that it reveals how many people chose each option on the screen after each question. The instant data allows for reteaching right then, right there, and the students even realize it. One of our questions came out with a nearly even distribution of answers (6 for a, 6 for b, etc.) Upon seeing this, they asked me to re-explain the concept before I had even finished re-reading the answer choices. In my intermediate class, students have been struggling with the usage of subjunctive v. other tenses/moods. A few minutes with sample sentences as questions and translations as answers seemed to really help–one student called it a “lightbulb moment”. You can easily add photos and even video to the instruction screen and questions. The kids ask for it. As I’ve previously described in this blog, this year has been a challenging one, faced with one particularly vocal group of students who really didn’t want to be there. When I finally find something that connects with them, it’s a keeper. At the end of the quiz, you can download a spreadsheet of the students’ answers that also shows how many questions each student answered correctly (coded green) and what their wrong answers were (coded red). The site was laggy on the student end at times. It is entirely possible, though, that this was due to our wifi network and not due to anything on Kahoot’s end. It is multiple choice. It is helpful for a short check-in, but not for my classes for actual testing. The speed aspect is great for competition, but not so for slower processors. In summary, I have really enjoyed using Kahoot, and plan to do so again. I am exploring having students write questions and quizzes for each other on it, hoping that they will invest even more of themselves into the process. #langcamp LIVE and in person! Ever wish you could have all your #langchat friends with you when you were planning? I certainly do! Aventuras Nuevas actually began about a year ago when I left the school where I’d taught for 15 years to take a position at another school. The new school needed a major curriculum overhaul, so I asked my Twitter friends, especially those from #langchat, for help in designing a new, vertically aligned, proficiency-based curriculum. So many volunteered that #langcamp was born as an online community. Throughout the summer of 2013, we shared resources, Skyped together, and tossed around the idea of a “teacher camp” at the beach. Logistically though, it just didn’t work out on relatively short notice, so instead we continued our digital collaboration and dreamed of “someday”… someday meeting face to face, someday working together in person, and someday sharing an amazing professional development experience together. So, that brings us to our super awesome exciting news! It is with great joy and a little trepidation that Laura Sexton (SraSpanglish) and I –with help from our friend Srta. Johnson–are proud to announce that we will have Langcamp LIVE this summer in Asheville, NC on July 9-10, and all language teachers (including pre-service teachers) are invited to join us. You won’t want to miss two days of high quality participant-driven collaboration in a beautiful family friendly environment. We have a great retreat planned, and we encourage you to bring your families too. Registration is open NOW, and there’s an early bird discounted rate for the first 15 participants. Hope to see you there! Stay tuned tonight for exciting information about #langcamp LIVE! It’s going to be AWESOME!!!! Check back here, or follow #langcamp on Twitter tonight.